The mountain view from Sherman County RV Park in Moro, Oregon. 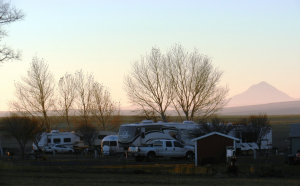 The Sherman County RV Park overlooks the cozy town of Moro and offers views of the pastoral countryside and Mt. Hood. Features: Open year-round; adjacent to the Sherman County Fairgrounds near Moro; 33 hook-ups with electricity, water, and sewer; free Wi-Fi; coin-operated laundry facility; new restrooms with shower facilities; level sites; picnic tables at each site. All ages and pets are welcome. Horse stalls and an arena are available at the Fairgrounds. Cost: $10 to $25 per night. Package rates include six nights with a seventh night for free. Monthly and long-term rates available. Directions: Take Highway 97 to the center of Moro. Turn east at the Sherman County RV Park sign, the park is about a mile to the RV Park adjacent to the Fairgrounds. Enter at the upper gate. Call the Camp Host, (541) 565-3127, if lost or if you run into an issues that could affect your stay. Read reviews at RVParkReviews.com or GoodSamClub.com.